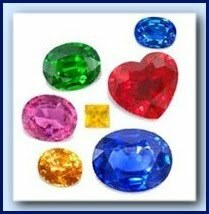 Did you know you are a precious gemstone upon the heart and shoulders of Jesus? God gave instructions to Moses on how to construct their garments, such as the ephod, the breastplate, and all the other articles. He directed that two beryl or onyx stones be engraved with the names of Aaron’s sons, six on each stone, and that one stone be placed on each shoulder. Why? “So Aaron shall bear their names before the Lord on his two shoulders as a memorial,” (Ex. 28:12 NKJV) as a remembrance when he went before the Lord on their behalf. God also instructed that the breastplate be woven of fine linen in gold, scarlet, blue, and purple, used for royalty and sacred items. On it was to be placed the beautiful gemstones of emerald, topaz, turquoise, sapphire, amethyst, diamond, and others. The original birthstones! God said, “And the stones shall have the names of the sons of Israel, twelve according to their names” (Ex. 28:21 NKJV), where they would be kept close to the heart of the priest. As the high priest, Aaron was to bear the names of the family of God upon his shoulders and his heart. Aaron was a type of Christ, bearing divine authority before God as the family’s advocate for their sins. Jesus, our High Priest and Advocate, bears our names as beautiful gemstones upon His heart and upon His shoulders before the Father. “As Aaron wore the ephod embellished with the memorial stones of Israel, bearing their names upon his shoulders and his heart, so the Lord Jesus bears upon His shoulders and heart the names of His family, as engraved precious gemstones, for a remembrance forever. ‘Say to Me, Lord, take now upon Your shoulders my name and bear my burden and take me upon Your heart and forgive my sin. Bring back my love as at the first. Wash and cleanse me of my sins. Remove my sackcloth and ashes and dress me in fine, white garments of linen, veil my face, and place a crown on my head..
Did you know you were a precious gemstone upon the heart of your Lord?